, bishop of Ely, was the son of Peter Gunning, vicar of Hoo, in Kent, and born there in 1613. He had his first education at the king’s school in Canterbury, where he commenced an acquaintance with Somner the antiquary, his school -fellow. At fifteen he was removed to Clare-hall, in Cambridge, was promoted to a fellowship in 1633, and became an eminent tutor in the college. Soon after he commenced M. A. and had taken orders, he had the cure of Little St. Mary’s from the master and fellows of Peter-house. He acquired much fame as a preacher, and was licensed as such by the university in 1641, when he distinguished himself by his zeal for the church and king, particularly by protesting | publicly against the faction, when most formidable, and urging the university to publish a formal protestation against the rebellious league, in a sermon at St. Mary’s. About the same time, paying a visit to his mother at Tunbridge, he exhorted the people, in two sermons, to make a charitable contribution for the relief of the king’s forces there; which conduct rendered him obnoxious to the powers then in being, who imprisoned him for a short time, and, on his refusing to take the covenant, deprived him of his fellowship. This obliged him to leave the university, but not before he had drawn up a treatise against the covenant, with the assistance of some of his friends, who took care to publish it. 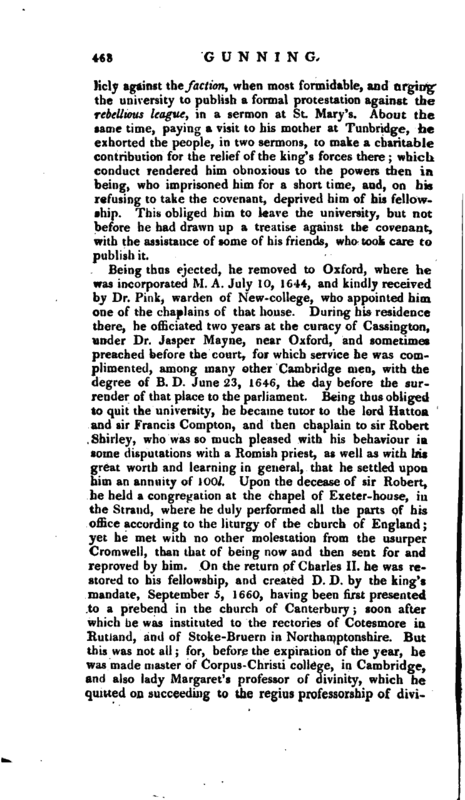 Being thus ejected, he removed to Oxford, where he was incorporated M. A. July 10; 1644, and kindly received by Dr. Pink, warden of New-college, who appointed him one of the chaplains of that house. During his residence there, he officiated two years at the curacy of Cassington, under Dr. Jasper Mayne, near Oxford, and sometimes preached before the court, for which service he was complimented, among many other Cambridge men, with the degree of B. D. June 23, 1646, the day before the surrender of that place to the parliament. Being thus obliged to quit the university, he became tutor to the lord Hatton and sir Francis Comptoti, and then chaplain to sir Robert Shirley, who was so much pleased with his behaviour in some disputations with a Romish priest, as well as with hris great worth and learning in general, that he settled upon him an annuity of 100l. Upon the decease of sir Robert, he held a congregation at the chapel of Exeter-house, in the Strand, where he duly performed all the parts of his office according to the liturgy of the church of England; yet he met with no other molestation from the usurper Cromwell, than that of being now and then sent for and reproved by him. On the return of Charles II. he was restored to his fellowship, and created D. D. by the king’s mandate, Septembers, 1660, having been first presented to a prebend in the church of Canterbury; soon after which he was instituted to the rectories of Cotesmore in Rutland, and of St^ke-Bruern in Northamptonshire. 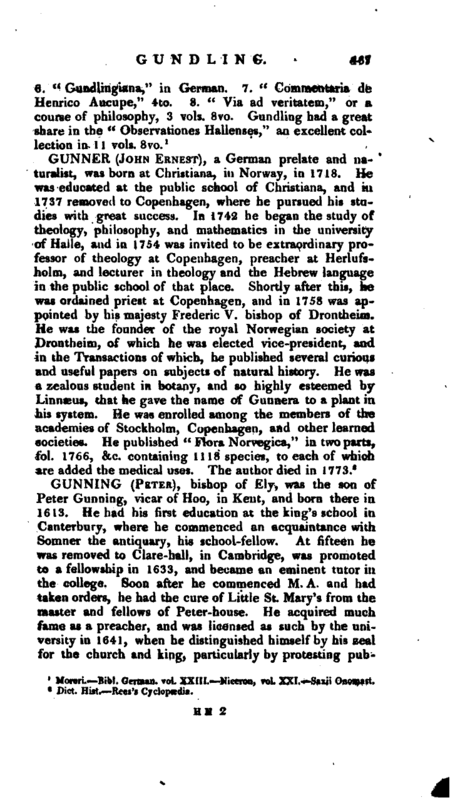 But this was not all; for, before the expiration of the year, he was made master of Corpus-Christi college, in Cambridge, and also lady Margaret’s professor of divinity, which he quitted on succeeding to the regius professorship of | divinity, and the headship of St. John’s college, upon the resignation of Dr. Tuckney, who had been obliged June 12, 1661, to give way for Gunning; he being looked upon as the properest person to settle the university on right principles again, after the many corruptions that had crept into that body. 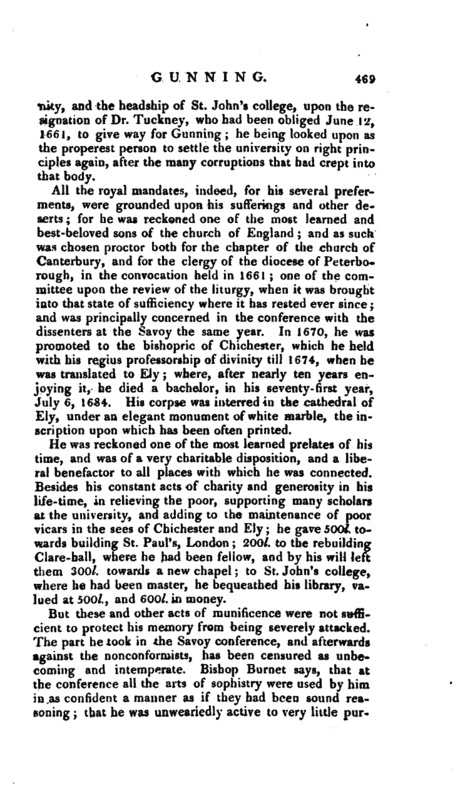 All the royal mandates, indeed, for his several preferments, were grounded upon his sufferings and other deserts for he was reckoned one of the most learned and best-beloved sons of the church of England and as such was chosen proctor both for the chapter of the church of Canterbury, and for the clergy of the diocese of Peterborough, in the convocation held in 1661; one of the committee upon the review of the liturgy, when it was brought into that state of sufficiency where it has rested ever since; and was principally concerned in the conference with the dissenters at the Savoy the same year. In 1670, he was promoted to the bishopric of Chichester, which he held with his regius professorship of divinity till 1674, when he was translated to Ely; where, after nearly ten years enjoying it, he died a bachelor, in his seventy-tirst year, July 6, 1684. His corpse was interred in the cathedral of Ely, under an elegant monument of white marble, the inscription upon which has been often printed. He was reckoned one of the most learned prelates of his time, and was of a very charitable disposition, and a liberal benefactor to all places with which he was connected. Besides his constant acts of charity and generosity in his life-time, in relieving the poor, supporting many scholars at the university, and adding to the maintenance of poor vicars in the sees of Chichester and Ely he gave 500l. towards building St. Paul’s, London '2001. to the rebuilding Clare-hall, where he had been fellow, and by his will left them 300l. towards a new chapel; to St. John’s college, where he had been master, he bequeathed his library, valued at 500l., and 600l. in money. But these and other acts of munificence were not sufficient to protect his memory from being severely attacked. The part he took in the Savoy conference, and afterwards against the nonconformists, has been censured as unbecoming and intemperate. Bishop Burnet says, that at the conference all the arts of sophistry were used by him in as confident a manner as if they had been sound reasoning; that he was unweariedly active to very little | purpose, and being very fond of the popish rituals and ceremonies, he was much set upon reconciling the church of England to Rome. 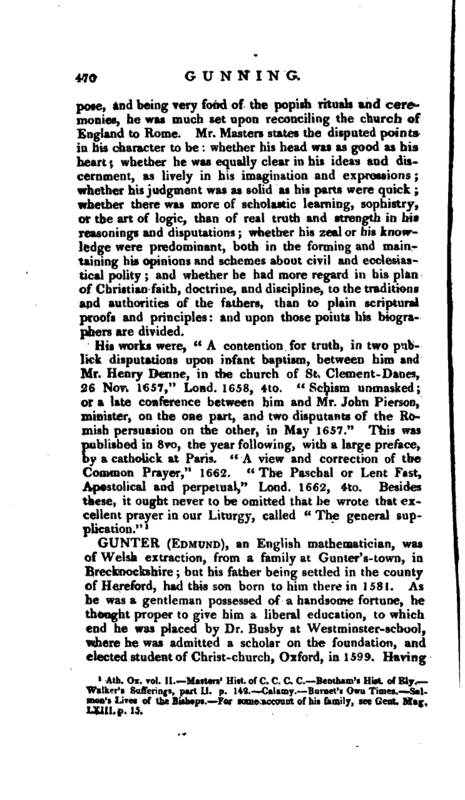 Mr. Masters states the disputed points in his character to be whether his head was as good as his heart whether he was equally clear in his ideas and discernment, as lively in his imagination and expressions whether his judgment was as solid as his parts were quick whether there was more of scholastic learning, sophistry, or the art of logic, than of real truth and strength in his reasonings and disputations; whether his zeal or his knowledge were predominant, both in the forming and maintaining his opinions and schemes about civil and ecclesiastical polity; and whether he had more regard in his plan of Christian faith, doctrine, and discipline, to the traditions and authorities of the fathers, than to plain scriptural proofs and principles: and upon those points his biographers are divided. Ath. Ox. vol. II. Masters’ Hist, of C. C. C. C. Bentham’s Hist, of Ely. Walker’s Sufferings, part II. p. 142. —Calamy. Burnet’s Own Times. Salmon’s Lives of the Bishops. For some account of his family, see —Gent. Mag. LXIII. p. 15.